Depending on what time of day you visit Giant Freakin’ Robot — along with the majority of pop culture websites out there (which you shouldn’t ever go to) — you might be fooled into thinking that we’ve actually just given up on reporting about anything but Guillermo del Toro’s upcoming robots ‘n’ monsters extravaganza, Pacific Rim. But take comfort in knowing we’re still devoting at least three stories a day to subject matter that doesn’t involve Idris Elba and Charlie Hunnam vengefully maneuvering enormous bots around the world. This, however, isn’t one of those stories. Swing that boat, boys! German composer Ramin Djawadi, responsible for the scores of such films as Clash of the Titans and Iron Man, has made the entire soundtrack for Pacific Rim available on Spotify. The soundtrack was just released from Warner Bros. on June 25, but now you don’t even have to wait until the movie comes out to figure out whether you want to put some hard-earned money down on it. While I usually don’t enjoy hearing a film’s score before I’m able to correlate imagery with the sounds, Djawadi isn’t the kind of composer who works heavily in nuanced atmospheric ambiance. His tracks tend to cling to immediacy and usually go for the throat, even if it’s just going to hold onto it for a while instead of ripping it out. This is in part due to his frequent use of guitars in his scores, which tends to cheapen things a bit, where a track is written around a riff rather than a particular movement or feeling that is supposed to be evoked. Take a listen to all the tracks below. Luckily, his work on Pacific Rim — which includes a few appearances from Djawadi’s past collaborator, Tom Morello from Rage Against the Machine — is keen on letting its non-orchestral stringed instruments fill out the soundscape, rather than driving the force behind it. Granted, this isn’t the case on all tracks, and much of it tends to be predictable in its patterns of switching between passive and active measures. But nobody said this had to be as good as a John Williams score. It just It has to sound good behind robot-and-monster melees, and in that respect, it is probably a success. 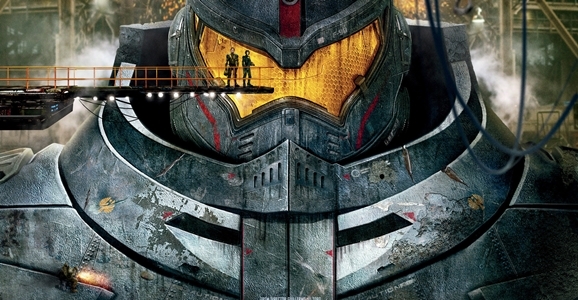 I’ll know for sure once I actually see it accompanying said melees when Pacific Rim is released on July 12, 2013. Go big or go extinct! Need another look at the trailer? Here you go. You can Stick it in that spot you are familiar with. First you offer it for a listen to everyone ,but to listen you must SIGN UP ? – for either Facebook or Spotify ? That ain’t free Brother !